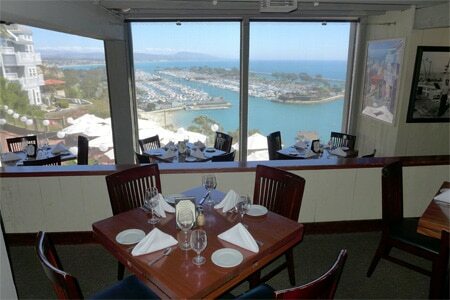 Romantic cliffside restaurant in Dana Point has a bird’s-eye view of the harbor as well as rather good steak and seafood fare. : Almost any Friday or Saturday night you can witness at least one marriage proposal at Cannons Seafood Grill, which has a picturesque harbor view on a Dana Point cliff. We find the classic main dining room and the wood deck terrace equally romantic. At night, the lights and open layout of the restaurant give the place a particularly fanciful and memorable glow. One reason for Cannons’ three decades of success is its warm and professional service. The other is the simple and fresh seafood and steakhouse-inspired dishes, from starters like the chili and ginger-seasoned calamari to mains of steak Oscar, and char-grilled day boat scallops and linguine tossed with sautéed shiitake mushrooms in a lobster sauce. A popular menu item is the cioppino made with Alaskan king crab, scallops, black mussels, shrimp, mahi mahi, salmon and swordfish sautéed in a rich tomato broth. Cannons also serves specials that rotate monthly. The relaxing lounge and terrace provide the perfect setting to unwind with a mai tai, piña colada or a tropical dessert such as mango sorbet or Key lime pie.